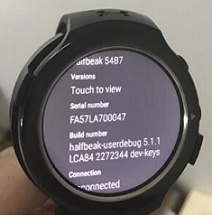 The HTC smartwatch codenamed 'Halfbeak' is finally seen taking birth. The device has been rumored a long time in the last October and some images were also leaked at that time. Now new images of the same design have again seen on Weibo. It has two dedicated buttons on the right side, a circular watch face without a flat tire and a rubber strap. At the back, it also has some pogo pins and heart rate sensor. It will run on latest version of Android wear and Google Play services. We might see 'Halfbeak' smartwatch soon in MWC 2017. It may be called with some different name but it is also possible that HTC changes its design little bit. Related 'Best Smartwatches for Women', 'Best Kids Trackers available in the market'. What is your best Smartwatch pick? Let us know in comments.